A trend is emerging over the past several months in the detached market space. The sales to actives ratio has been slipping, sales are slow, and price growth has stalled. The detached segment has now shifted to a balanced/ buyers market depending on the area. View July detached report here. While there was generally an increase in sales year over year for most areas, this was due to the implementation of a foreign buyers tax which was introduced without warning in August, 2016. With that being said, Vancouver West experienced fewer sales this August than it did one year ago. This is substantial and worth noting as the higher end detached market has been severely impacted from a slow down of foreign capital. New listings across REBGV fell 7% and were 4% below the ten year average for the month of August. Overall inventory levels were down 1% from one year ago. As you can see, the detached market is in either a balanced market or a buyers market depending on the area. All areas have been trending downwards after peaking in the busier spring market. REBGV Sales to Actives Ratio slows to 16% in August. 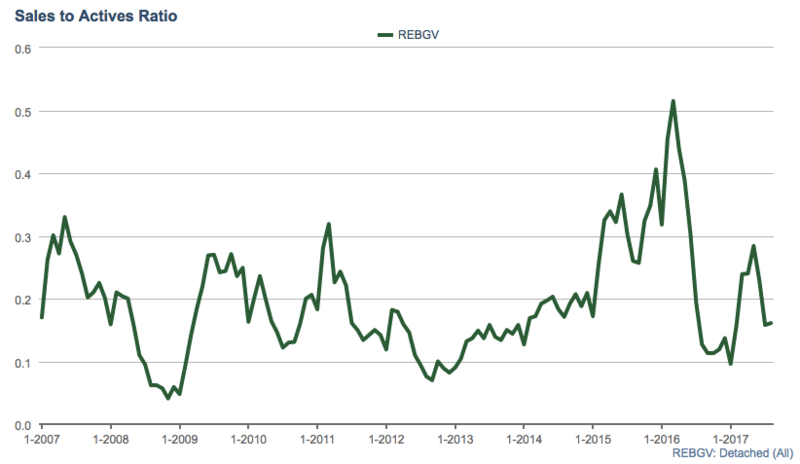 The average sales price for REBGV was up 7.2% year over year. This is slightly misleading though as it is comparing to August 2016 when prices fell 14% in one month following the foreign buyers tax. In the chart below i’ve also included the 3 month rolling average for REBGV which paints a more accurate picture of detached price trends. The sales to actives ratio is probably one of the most important metrics to follow. The detached market has clearly cooled, and although prices haven’t moved a whole bunch, it’s evident the market peaked out over a year ago. The drastic run ups of 30-40% annual growth in 2015 and 2016 are long behind us. I expect we will see continued cooling in the coming fall/winter months. However, we will have to keep a close eye on new listings, if those begin to sag again it could reverse this trend.